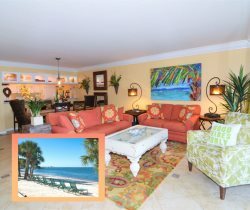 Resort Harbour Properties provides vacationers a comfortable condo with a Gulf view at Sanibel Harbour. In addition to daily sunsets, this condo features newer appliances, furniture and accessories. Well-coordinated and very comfortable. King bed in the master, two twins in the guest bedroom and sleeper sofa. Check out views of the Gulf from the screened-in balcony and master bedroom. WiFi internet connection. You may have found this rental on HomeAway 3893215, HA ID 3893215, VRBO 3893215ha or Vacation Rentals 3893215. Kara was excellent to work with. Very good at her job. Thanks so much! The resort property is beautiful and well maintained. The pool and spa were very clean. Everyone was very friendly. Thank you! Other than a few emails, I did not have much experience with your team. However, that was not a bad thing as everything that I needed to know was provided through the emails. Very satisfied with the accommodations. Very comfortable! The view from the balcony was spectacular.